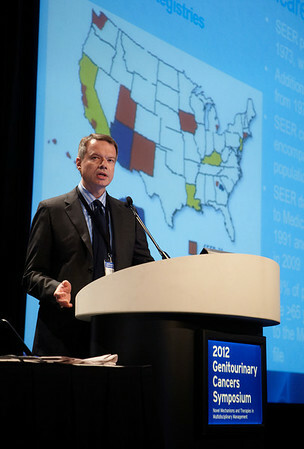 San Francisco, CA - 2011 Genitourinary Cancers Symposium - Jay P. Ciezki, MD discusses Abstract #4 Long-term toxicity and associated cost of initial treatment and subsequent toxicity-related intervention for patients treated with prostatectomy, external beam radiotherapy, or brachytherapy: A SEER/Medicare database study during Oral Abstract Session A: Prostate Cancer at the 2011 Genitourinary Cancers Symposium (GU) meeting at the Marriott Marquis here today, Thursday February 2, 2012. A record 2500 attendees from around the world were on hand to learn the latest treatment and research in Genitourinary cancers from fellow physicians, researchers, health care professionals, cancer survivors and patient advocates. Photo by © ASCO/Todd Buchanan 2012 Technical Questions: todd@toddbuchanan.com; Phone: 612-226-5154.